Generating cardiomyocytes from pluripotent stem cells in vitro allows access to large amounts of cardiac tissue in vitro for basic science and clinical applications. This protocol uses the atrializing factor Grem2 to both increase the numbers of cardiomyocytes obtained and to generate cardiomyocytes with an atrial phenotype. Bylund, J. B., Hatzopoulos, A. K. Differentiation of Atrial Cardiomyocytes from Pluripotent Stem Cells Using the BMP Antagonist Grem2. J. Vis. Exp. (109), e53919, doi:10.3791/53919 (2016). Protocols for generating populations of cardiomyocytes from pluripotent stem cells have been developed, but these generally yield cells of mixed phenotypes. Researchers interested in pursuing studies involving specific myocyte subtypes require a more directed differentiation approach. By treating mouse embryonic stem (ES) cells with Grem2, a secreted BMP antagonist that is necessary for atrial chamber formation in vivo, a large number of cardiac cells with an atrial phenotype can be generated. 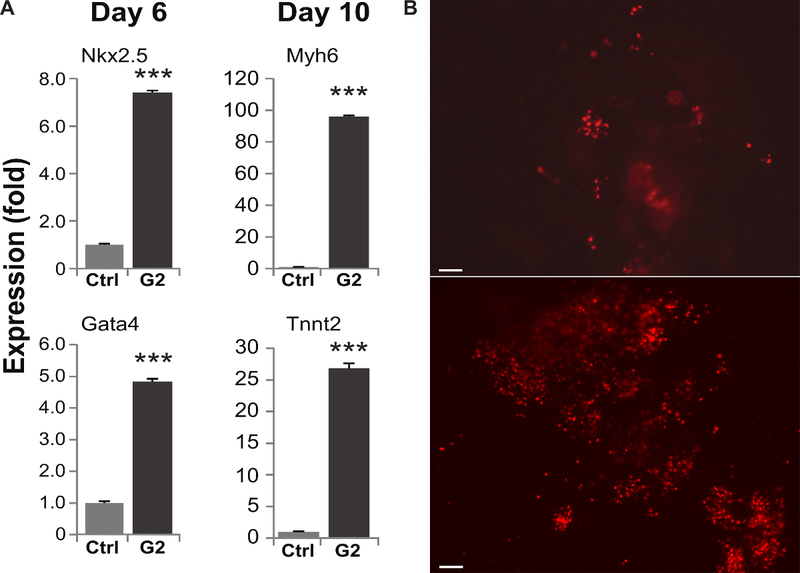 Use of the engineered Myh6-DSRed-Nuc pluripotent stem cell line allows for identification, selection, and purification of cardiomyocytes. In this protocol embryoid bodies are generated from Myh6-DSRed-Nuc cells using the hanging drop method and kept in suspension until differentiation day 4 (d4). At d4 cells are treated with Grem2 and plated onto gelatin coated plates. Between d8-d10 large contracting areas are observed in the cultures and continue to expand and mature through d14. Molecular, histological and electrophysiogical analyses indicate cells in Grem2-treated cells acquire atrial-like characteristics providing an in vitro model to study the biology of atrial cardiomyocytes and their response to various pharmacological agents. Pluripotent stem cells are a powerful tool for generating and studying cells from a host of difficult to access tissues for basic research and pre-clinical studies, especially in humans1-5. Proper modulation of developmental signaling pathways can direct the differentiation of pluripotent stem cells to the desired phenotypic fate. Many protocols have been developed to generate cardiomyocytes (CMs) from pluripotent stem cells6-14. These protocols generally involve modulation of TFGβ superfamily (Activin, BMP, and TGFβ) and Wnt pathways through timed addition of exogenous growth factors and/or small molecules10,12-15. These protocols are generally effective at increasing the percentage of cells that become CMs, but lack specificity, generating a mixed population of cells representing atrial, ventricular, and nodal/conduction system lineages. In order to study specific cardiac subtypes a more directed differentiation approach is required. Gremlin2 (Grem2, also called Protein Related to Dan and Cerberus or PRDC for short) is a secreted BMP antagonist that is necessary for proper cardiac differentiation and atrial chamber formation during cardiac development in zebrafish16. Treating differentiating embryonic stem cells with Grem2 at differentiation day 4, just after peak expression of mesodermal markers T-Brachyury and Cerberus like 1, increases the yield of CMs and generates a pool of cells predominantly of the atrial lineage14. Recombinant Grem2 is used to treat the differentiating cells and can be made using standard protein production techniques17 or can be purchased commercially. It is highly soluble in aqueous solutions and may be added exogenously to cultures at the desired time point. Differentiation can be tracked using RT-qPCR to quantify expression of markers representative of cardiovascular progenitors, cardiac progenitors, and committed CMs. Immunofluorescence can also be used to identify and visualize spatial distribution of cardiac cell types. Applications that require pure populations are more readily carried out when using a reporter system to identify and isolate CMs. For this purpose, we have introduced the αMHC-DsRedNuc construct into the mouse CGR8 ES cell line14. CGR8 cells grow and remain pluripotent without feeder cells, facilitating expansion and differentiation assays18. The ES cell line contains a DSRed fluorescent protein coding sequence with a nuclear localization signal under the cardiac-specific alpha Myosin Heavy Chain (αMhc or Myh6) gene promoter. Using these cells, CMs can be easily identified and isolated for quantification, cell sorting, electrophysiology, drug screens, and studying mechanisms of atrial differentiation. 1. Preparation of Cell Culture Media, Solutions, and Reagents. Prepare 500 ml of Mouse embryonic stem cell (mESC) media by mixing and sterile filtering (0.2 μm pore size) 445 ml Glasgow Minimum Essential Medium (GMEM), 50 ml heat inactivated fetal bovine serum (FBS), 5 ml 100X concentrated L-Glutamine replacement, 5 µl recombinant mouse Leukemia Inhibitory Factor (LIF) at 1 x 107 units per ml, and 1.43 µl ß-Mercaptoethanol (final concentration is 50 µM). Store at 4 ˚C until ready to use. Prepare 500 ml of Embryoid Body (EB) differentiation media by mixing and sterile filtering 391 ml Iscove's Modified Dulbecco Medium (IMDM), 100 ml heat inactivated FBS, 5 ml 100X concentrated L-Glutamine replacement, 5 ml 100X concentrated Non-essential amino acids (NEAA), and 2.86 µl ß-Mercaptoethanol (final concentration is 100 µM). Store at 4˚ C until ready to use. Prepare 0.2 % w/v solution of Gelatin by mixing 1 g porcine skin gelatin powder with 500 ml of filtered, distilled H2O. Sterilize by autoclaving. Note that the gelatin may not be completely soluble in water at RT. After autoclaving the gelatin should be completely dissolved. Store at RT until ready to use. Prepare Grem2 recombinant protein aliquots by dissolving 50 µg pellet of lyophilized Grem2 in 100 µl phosphate buffered saline (PBS) supplemented with 0.1 % BSA to make a 0.5 µg/µl stock solution. Aliquot 20 µl of this stock solution into five sterile 1.5 ml centrifuge tubes and store at -80˚ C until ready to use. Prepare PBS according to published protocols or purchase as a 10X stock and dilute 1:10 with filtered, distilled H2O to make a 1X working dilution19. Sterilize PBS by autoclaving prior to use. Store at RT until ready to use. In some steps, DPBS without Ca2+ and Mg2+ is used. This is purchased as a 1X solution. Ordering information is included in the table of reagents. In a sterilized tissue culture hood add 5 ml of 0.2 % gelatin solution to each 10 cm tissue culture dish for coating. Place dishes in incubator at 37 ˚C for at least 30 min or up to 4 days. In a sterilized tissue culture hood add 1 ml of 0.2 % gelatin to each well of a 6-well tissue culture plate. Place plates in incubator at 37 ˚C for at least 30 min or up to 4 days. Prepare mESC media by warming to RT in a sterilized tissue culture hood. Add 10 ml RT media to a gelatin-coated 10 cm dish. Remove 1 vial of mESCs containing approximately 1 x 106 cells from cryostorage. Holding cryovial with tongs, place in a 37 ˚C water bath. Gently swirl until cell suspension has thawed and only a small ice crystal remains in the center of the vial. Dry off vial with a disposable lint-free wipe and sterilize with 70% EtOH. In a sterile tissue culture hood remove thawed cells using a P1000 tip from cryovial and transfer to 10 cm dish prepared in 4.1.1). Place 10 cm dish into 37 ˚C humidified cell culture incubator with 5% CO2 and evenly distribute cells by gently moving the plate front to back, then side to side. Allow cells to attach to plate O/N or at least 6 hr. First thing the next morning check cells for attachment using a bright field microscope. Some cell debris and dead cells will be observed in the media. This is normal. Aspirate media from dishes and replace with 10 ml fresh mESC media. Continue to change media on cells every day to prevent differentiation. Passage cells when 60-70% confluent. Prepare cells for passaging by aspirating media and rinsing with 5 ml sterile 1X DPBS without MgCl2 and CaCl2. Add 2 ml 0.05% trypsin-EDTA solution. Place in incubator at 37 ˚C for 5 min. While cells are incubating, prepare new 10 cm dish by aspirating gelatin solution and adding 10 ml of RT mESC media. After 5 min check the cells for detachment. If cells remain attached, continue to incubate at 37 ˚C for 2 min at a time until completely detached. Quench trypsin-EDTA by adding 3 ml of mESC media. Transfer cell suspension to a 15 ml centrifuge tube and spin at 200 x g for 5 min to pellet. Aspirate media from pellet and re-suspend in 10 ml mESC media. Depending on desired split ratio, add 0.5-1.0 ml of cell suspension to each dish prepared in step 4.2.2). Place dish in incubator and evenly distribute cells by gently moving back to front then side to side. Allow cells to attach O/N or for at least 12 hr. NOTE: A split ratio of 1:10 - 1:20 is common for most mESC lines. This ratio may vary depending on the line used, passage number, and desired confluence on the new dish. For a 1:10 split ratio transfer 1 ml of cell suspension into 9 ml mESC media and plate in a freshly prepared gelatin-coated 10 cm dish. NOTE: All steps except centrifugation are performed in a sterile tissue culture hood. Upon 70 % confluency (usually 24-48 hr post-passage), use the cells for EB formation. Prepare cells for EB formation by detaching and pelleting according to sections 4.2.1) - 4.2.3). Note: It is best to passage cells at least one time post-thaw and check for health (e.g., very little cell death, no contamination, proper morphology) and robust growth (e.g., population doublings occurring every 24-48 hr) prior to use for making EBs. Re-suspend pellet in 5 ml EB media. Count cells using a hemocytometer or automated cell counter. Dilute cell suspension in required volume of EB media to make a final concentration of 25 cells/µl (or 2.5 x 104 cells/ml). Note that each lid of a petri dish holds about 60 EBs and requires about 1.3 ml of cell suspension. At this step, prepare sufficient volume of cell suspension to generate the desired number of EBs. For example, if 240 EBs are required for experiment, prepare 5.2 ml at 2.5 x 104 cells/ml. NOTE: mESCs that are not used for EB formation can be used for future experiments by spinning down, re-suspending in mESC media and plating as described in section 4.2. Prepare sterile 10 cm bacterial petri-dishes for hanging drop formation by adding 2 ml of 1X PBS to the bottom of each. Transfer EB suspension from step 5.1) to a sterile solution basin. Remove lid from prepared petri dish and carefully deposit sixty, 20 µl drops of EB suspension onto the inner surface. Accomplish this efficiently using a multi-channel pipet fitted with 6 tips. Each 20 µl drop now has 500 cells. Gently replace lid onto bottom half of the bacterial petri-dish, being careful not to dislodge hanging drops. Place dishes into cell culture incubator at 37˚ C. After 2 days, cells are ready to wash down as described in 5.3). Note: All wash-down steps are performed in a sterile tissue culture hood. After 2 days EB's are ready for washing down and transfer to 6 cm bacterial petri dishes. Pre-warm 3 ml of EB media per petri dish to RT. Each 6 cm bacterial petri dish can effectively hold 2 lids worth of hanging drops. Note: Be sure to use a non-coated petri dish for this step (see materials table). Do not use a tissue culture dish or any other surface that encourages cell adhesion. EBs should remain suspended in media until ready to be plated as described in section 6. Remove 10 cm petri dishes from incubator and place into sterile tissue culture hood. Carefully remove lid with EBs and tilt at a 45 degree angle. Using a 5 ml serological pipet containing 3 ml of RT EB media, gently wash EBs into a pool at the bottom of the lid. Carefully inspect the lid for EBs that are stuck to the surface and re-rinse if necessary. After washing all EBs transfer to a 6 cm petri dish. Repeat steps 5.3.2)-5.3.4) for all EBs. Each 6 cm petri dish should contain EBs from two 10 cm lids. Place all dishes back into incubator at 37 ˚C for two more days. NOTE: EBs that are too close together in suspension may stick together and form large aggregates. This can negatively impact cardiac differentiation efficiency as well as significantly reduce the numbers of available EBs. To prevent aggregation, EBs should be checked each day and separated by gently moving back and forth, then side to side. The use of bacterial dishes in the early differentiation steps is necessary to prevent EB attachment to the dish and allow EBs to grow in suspension. Prepare Grem2 treatment medium by adding sufficient volume of stock (0.5 µg/µl) Grem2 to RT EB medium for a final dilution of 1-5 µg/ml. NOTE: The effective concentration for treatment of EBs varies depending on the cell line and specific activity of the current lot of Grem2. It is recommended that prior to use the dose is titrated to find maximal effectiveness. For the CGR8 mESC line we routinely use 3-5 µg/ml of Grem2. Effective concentrations of Grem2 for atrial myocyte generation will produce rapidly contracting cells between days 7-8 that are widespread throughout each well. If contracting phenotype is not observed in treated cultures it is recommended that the Grem2 dose be titrated within the range indicated. Prepare 6-well tissue culture plates by aspirating gelatin coating solution from each well and adding 2 ml of RT Grem2 treatment media. Remove EBs from incubator and place into sterile tissue culture hood. Using a P1000 set to 100 µl transfer 30 EBs from 6 cm petri dishes to each well. Place EBs into incubator and evenly disperse by gently moving plate back to front then side to side. After EBs have attached to gelatin coated wells, replace Grem2 media every two days until day 10. After day 10, discontinue the Grem2 treatment and add fresh EB media every two days to maintain healthy cells. NOTE: After attaching, EBs will flatten out along the surface of the coated plate. Aspirate media from each well and rinse twice with 1 ml per well of sterile DPBS minus Ca2+ and Mg2+. Add 0.5 ml 0.25% sterile Trypsin-EDTA solution to each well from which cells will be collected. Place plate in incubator at 37 ˚C for 5 min. After 5 min check cells for dissociation. If cells still remain attached to bottom of the well tap gently to loosen. If tapping does not loosen cells, place back into incubator and monitor every 2 min until cells are completely detached. Neutralize Trypsin-EDTA solution by adding 0.5 ml EB media to each well. Transfer entire 1 ml of cell suspension to a 1.5 ml micro centrifuge tube. 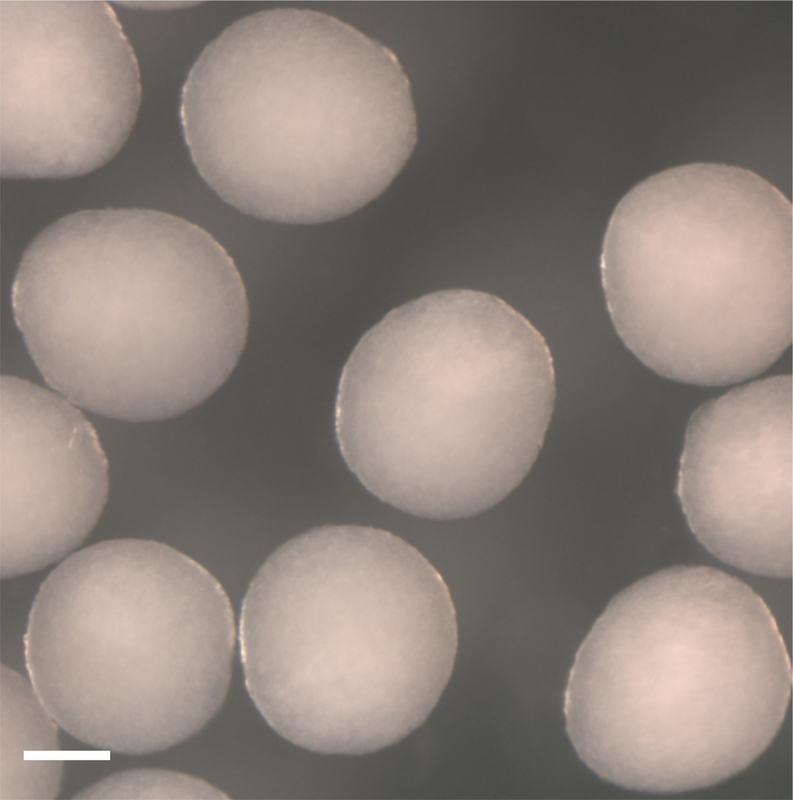 Pellet cells by spinning in a table-top centrifuge for 5 min at 300 x g.
Aspirate media from pellet and move on to lysis immediately or store pellet at -70 ˚C until ready for lysis. Long-term storage of pellets is not recommended as this can lead to degradation of RNA. At this point cells are ready for RNA isolation using a commercial column extraction kit or using RNA extraction reagent according to the protocols supplied by the manufacturers (see table of materials). Once isolated, reverse transcribed RNA and use cDNA for RT-qPCR analysis using standard techniques20, 21. NOTE: Primers used by this lab for RT-qPCR are listed in Table 1. Atrial identity is confirmed using a combination of RT-qPCR to look at expression of atrial and ventricular genes and electrophysiology to record action potential duration (see section 8). A selection of genes is included in this protocol as an example of reliable atrial and ventricular markers. Further information about atrial and ventricular gene expression in the context of pluripotent stem cell differentiation is found in reference 14. Aspirate media from each well and rinse twice with 1 ml per well of sterile PBS. Add 0.5 ml of 1 mg/ml collagenase solution to each well. Place plate in incubator at 37 ˚C for 10 min. After 5 min check cells for dissociation. If cells still remain attached to each other or the bottom of the well tap gently to loosen. Further dissociate the cells by gentle trituration with a P1000. NOTE: To facilitate patch clamp recordings cells should be triturated until a single-cell suspension is achieved. Add 0.5 ml EB media to each well and mix by pipetting. Aspirate media from cell pellets. Re-suspend cells in 500 µl PBS with 10% FBS, being sure to triturate into a single cell suspension. NOTE: Many excellent protocols have been published in this journal on using single cell patch clamp to measure cell membrane potentials. For detailed information on how to perform single cell patch clamp the novice reader is referred to these protocols21-24. The following contains specific information for this protocol that will help the experienced electrophysiologist prepare and handle mESC derived CMs for subtype characterization. Prepare intracellular recording solution composed of the following: 10 mM HEPES buffer, 5 mM MgATP, 2 mM EGTA, 110 mM potassium glutamate, 10 mM KCl, and 10 mM NaCl. Adjust solution to a pH of 7.2 using NaOH. Prepare extracellular recording (bath) solution composed of the following: 2 mM HEPES, 10 mM glucose, 1 mM MgCl2, 2 mM CaCl2, 5.4 mM KCl, and 137 mM NaCl. Adjust solution to a pH of 7.4 using NaOH. Prepare a glass pipet that measures 2-5 MΩ resistance when backfilled with recording solution using standard borosilicate glass with filament. Transfer 100 µl of suspended cells into recording chamber containing extracellular recording solution using a P200. NOTE: Cells may be patched in suspension or, to facilitate handling and use for drug treatment and/or perfusion assays, may be seeded onto a gelatin coated coverslip as outlined in 8.2.5). Prepare gelatin coated glass coverslips by placing a 10 mm diameter glass coverslip into each well of a 6-well plate and covering with gelatin solution as described in section 3.1) of this protocol. After at least 30 min aspirate gelatin solution and add 100 µl of suspended cells directly to coverslip and place entire 6-well plate into incubator for at least 2 hr or until cells have attached. After cells have attached, remove cover slip and place in recording chamber with extracellular recording solution. NOTE: If using the αMHC-DsRed fluorescent cardiac reporter mESC line, CMs may be identified by their red fluorescent nuclei. If not using a cardiac reporter line, spontaneously contracting cells can be observed and isolated for measurements. Pluripotent stem cell derived CMs are usually smaller and more rounded, lacking the characteristic rectangular morphology of fully formed adult cardiac myocytes. Make all recordings at 37 ˚C. Patch single cells using whole cell clamp in current-clamp mode with a borosilicate glass pipet of 2-5 MΩ resistance. Use gentle negative pressure to achieve gigaohm seal prior to gaining whole cell access. Apply rapid negative pressure to rupture membrane and gain whole cell access prior to recording membrane potentials. Evoke action potentials using 4 msec depolarizing current injections. NOTE: For PSC-derived CMs the amount of current required to reproducibly trigger action potentials may vary. In order to find optimal threshold current, start at a relatively low current and increase triggering current amplitude in a stepwise fashion until reproducible action potentials are obtained. NOTE: Action potential durations for Grem2-induced atrial myocytes are usually in the range of 20-40 ms and lack a plateau phase (Figure 6B). Prior to differentiation, pluripotent stem cells should be compact and free of spontaneous differentiation. The cells shown in Figure 1A are ready to be singularized and used for hanging drops as described in 5.1 of the protocol section. The cells shown in Figure 1B are spontaneously differentiating and should not be used for preparation of hanging drops. The panels included in Figure 2 show successfully formed EBs at differentiation day 2. Quality EBs generally form best within evenly spaced, well rounded hanging drops as shown in Figure 2. By differentiation day 2, EBs should be visible to the naked eye as spherical arrangements of differentiating stem cells at the tips of the hanging drops (Figure 2). These EBs are ready for wash-down as described in 5.3 of the protocol section. During days 2-4, washed-down EBs in suspension should continue to grow in size. At day 4, well-formed EBs should be free-floating and homogeneous in size and shape (Figure 3). The EBs shown in Figure 3 are ready to be transferred to pre-coated plates and treated with Grem2 as described in 6.1-6.3 of the protocol section. Once plated, EBs should flatten as cells migrate out from the EB onto the surface of the tissue culture plate. Shown in Figure 4 are examples of properly attached EBs at differentiation days 8 (left panel) and 10 (right panel). Cells should continue to be monitored daily to be sure they remain attached and to check for cardiac differentiation as described below. Contracting cells, indicating the presence of CMs, may be observed as early as day 6 and as late as day 9. Typically, contracting cells will be present at day 8 of differentiation. The numbers of contracting cells in each well should continue to increase through differentiation day 14. In non-treated control wells small, slowly contracting patches are observed (Video S1) while in Grem2 treated wells large patches with a relatively fast contracting rate are common (Video S2). Occasionally, cardiac differentiation fails to occur. In such cases the timing of Grem2 treatment, the activity of the protein, and the state of the cells prior to differentiation should be re-evaluated to be sure that each of these conditions is optimized as described in this protocol (see discussion). Figure 5 shows results typical of Grem2-treated cultures and untreated controls. RT-qPCR analysis of gene expression in cells collected and lysed as described in 7.1-7.2 of the protocol section typically reveal high levels of cardiac structural and regulatory genes in Grem2-treated cultures (Figure 5A). If the αMHC-DsRed-Nuc cell line is being used, the increased yield of CMs can be observed visually as higher numbers of DsRed-labeled nuclei in Grem2-treated wells (Figure 5B, bottom panel). In addition to generating an increased number of CMs, Grem2 treatment also biases differentiation towards an atrial like phenotype. The atrial phenotype is usually confirmed in two ways. First, RT-qPCR analysis of cells collected as described in 7.1-7.2 of the protocol section should reveal that genes characteristic of atrial CMs are upregulated while ventricular genes are downregulated (Figure 6A). Second, patch clamp measurements of cellular action potential duration (as described in 8.1-8.2 of the protocol section) reveals that a short, atrial-like action potential predominates among Grem2 treated cells (Figure 6B). Figure 1. 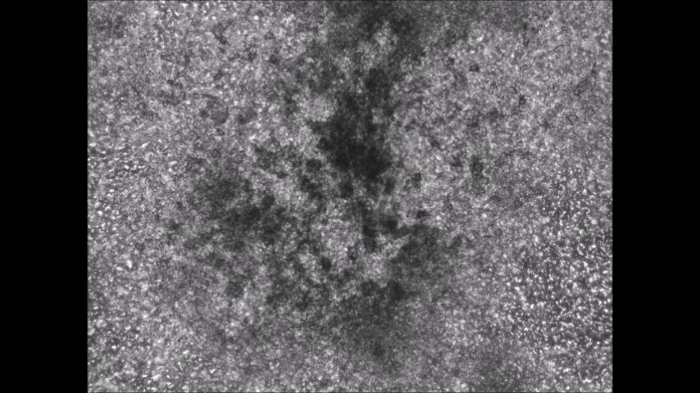 Representative mouse embryonic stem cells (mESCs). 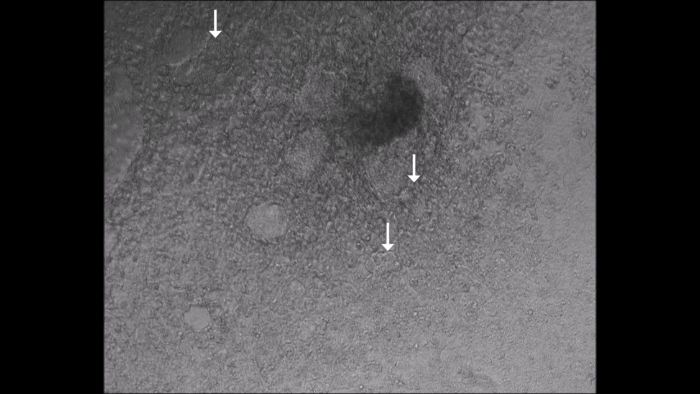 Pluripotent mouse embryonic stem cells prior to EB formation with characteristic large nucleus, compact colony-forming morphology (A, black arrows), and white phase borders (A, orange arrows). Spontaneous differentiation of mouse ES cells is indicated by larger, single cells separated from colonies (B, black arrows) and loss of phase border around colonies (B, orange arrow). Images captured using an inverted phase contrast microscope. Scale bars represent 50 µm. Please click here to view a larger version of this figure. Figure 2. Embryoid bodies (EBs) at day 2 of differentiation. Hanging drops suspended from a petri dish lid (left, scale bar is 2 cm) are evenly spaced and homogeneous in size. EBs in hanging drops are observed as compact spheres in the center of each drop (right, scale bar is 1 mm). Please click here to view a larger version of this figure. Figure 3. EBs in suspension at day 4 of differentiation. Ideal EBs should be homogeneous in size and shape with minimal adherence to each other or the bottom of the plate. Images were captured using a dissecting scope under sterile conditions. Scale bar represents 100 µm. Please click here to view a larger version of this figure. Figure 4. Typical EB morphology after plating. Plated EBs at days 8 (left) and 10 (right) of differentiation. As EBs attach to gelatinized plates, they flatten out and appear as dense centers surrounded by an increasingly confluent monolayer of cells. Small pockets of contracting cells are generally observed around differentiation days 6-8 near the center of the EB. These pockets continue to expand throughout the differentiation protocol to form larger sheets of contracting cells in the surrounding monolayers. Images captured using an inverted phase contrast microscope and. Scale bars represent 200 µm. Please click here to view a larger version of this figure. Figure 5. Cardiac differentiation in Grem2-treated and non-treated control wells. qPCR analysis of cardiac markers indicates an increase in cardiac gene expression in EBs treated with Grem2 as early as day six and continuing through day 10 of differentiation (A). The engineered αMHC-DsRed-Nuc cell line shows large pools of DsRed-labeled CMs in cultures treated with Grem2 (B, bottom) vs. non-treated controls (B, top). Figures adapted with permission from14. Error bars represent SEM from at least 3 replicate experiments. Please click here to view a larger version of this figure. Figure 6. Characterization of atrial-like cardiac phenotype. qPCR analysis indicates an increase in expression of atrial genes and downregulation of genes associated with ventricular CMs in Grem2-treated samples (A). 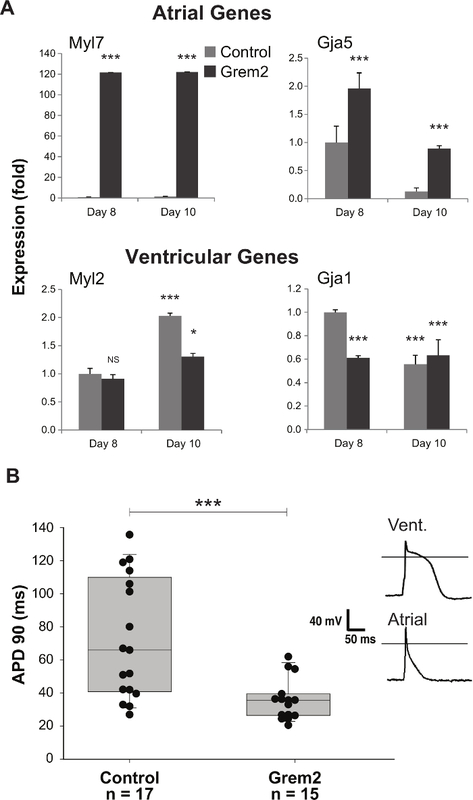 Control cultures produce CMs with action potential duration characteristic of atrial and ventricular cells while treatment with Grem2 generates cell populations with the short action potential duration characteristic of atrial myocytes (B). Samples were compared using student's t test. *, p < 0.05; ***, p < 0.001 Figures adapted with permission from14. Error bars represent SEM from at least 3 replicate experiments. Please click here to view a larger version of this figure. Video S1. Non-treated control wells (Right click to download). Small, slowly-contracting pockets or patches of cardiac myocytes around the periphery of the EB (white arrows). Video was taken at differentiation day 10. Video S2. Grem2-treated wells (Right click to download). Typical results observed in Grem2-treated cells. Large patches of quickly contracting cells are observed throughout the plated EB. Video was taken at differentiation day 10. Table 1. List of qPCR primer sequences. Primer sequences are listed alphabetically by gene name. Sequences are provided 5' to 3' for all genes analyzed in Figures 5 and 6. This protocol routinely produces cultures with a high percentage of CMs that are characteristic of the atrial lineage. As with any differentiation protocol, the quality of the mESCs prior to differentiation should be given particular attention. mESCs should be routinely monitored for proper morphology (Figure 1A). Any spontaneous differentiation that occurs prior to formation of EBs will severely limit the efficiency of cardiogenesis and should be removed before passaging (Figure 1B). EB size also affects cardiogenesis. Starting cell numbers between 200 and 1,000 per EB have been tested and 500 cells per EB routinely produces the highest numbers of CMs. Cells that are passaged the day prior to EB formation also tend to differentiate more efficiently. The "hanging drop" method is used to generate EBs in this protocol25. Other methods for making EBs used for cardiac differentiation have been reported26-29. The "hanging drop" method is simple and inexpensive, readily adopted in any laboratory with common cell culture equipment and materials, and can be conducted by anyone with cell culture experience. It is also versatile, producing EBs that may be easily manipulated, transferred, plated, or collected for RNA analyses according to the needs of the investigators. It is also scalable, producing small or large numbers of EBs as needed. The protocol dictates the plating of EBs onto gelatin coated plates at Day 4 of differentiation. This step converts differentiating EBs into the more typical monolayer format common to tissue culture. In some cases it may be more convenient and or necessary to leave the EBs in suspension rather than plating. If suspension EBs are preferred for downstream applications the cells may be left in suspension throughout the differentiation process instead of being plated at day 4. When treating with Grem2, the EBs are placed into 1.5 ml centrifuge tubes and allowed to settle by gravity. The media is then carefully removed with a P1000, leaving a small amount behind to prevent aspiration of the EBs, and 1.5 ml Grem2 media is added to the tube. This suspension is then transferred to a 6 cm petri dish and placed back at 37˚C. The media is changed using the micro centrifuge tube method indicated above every two days. Differentiation day 4 was chosen for treatment of cells with Grem2 based on expression analysis of genes generally associated with major developmental events. Addition of Grem2 after peak expression of the gastrulation marker genes T Brachyury and Cerberus like 1 and at the onset of expression of cardiac progenitor cell markers such as Nkx2-5 is critical for both cardiogenesis and atrial specification. Because peak expression of these genes may vary slightly among cell lines it is recommended to monitor expression of these genes during differentiation to determine optimal timing for Grem2 addition. Of the lines tested for this protocol, most responded to treatment with Grem2 between days 4 and 5 of differentiation. As with any recombinant protein, the activity of Grem2 varies from lot to lot. It is therefore recommended that Grem2 from the same lot is used for each set of experiments to maintain consistency. When a new lot is purchased, effectiveness may be assessed by titrating the dose in the range of 1-5 µg/ml. This protocol yields CMs from the atrial lineage of sufficient number for analysis and culture. Cells produced using this protocol may be analyzed via flow cytometry, electrophysiology, RT-qPCR, or re-cultured for use in live cell assays. To facilitate the identification and isolation of CMs after culture the αMHC-DsRed-Nuc reporter line was developed and is routinely used by our laboratory. This protocol uses serum to maintain healthy cell cultures throughout the differentiation process. While this protocol routinely produces robust, atrial-like cardiac differentiation, use of serum introduces an undefined element to the differentiation process. This may limit usefulness of the protocol in cases where a more defined media is required. If a more defined media preparation is required, serum may be replaced by KnockOut Serum Replacement30. When switching to a defined culture media it is recommended that timing and concentration of Grem2 treatment be re-optimized as already described in this section. RT-qPCR is used to quantify the expression of genes specific to atrial and ventricular myocytes. Grem2 treatment leads to an induction of atrial specific genes while down regulating or not affecting the expression of ventricular genes. This result is typical for Grem2-induced CMs. A suggested set of genes for assessing atrial identity is included in this protocol. An expanded set of genes and a discussion of their relevance can be found in works referenced by this protocol14,16. As the field continues to evolve and our understanding of cardiac differentiation improves it is recommended that this list of atrial and ventricular identity markers is assessed and revised as needed. Generating homogeneous cultures of CMs will facilitate clinical research efforts focused on diseases known to affect specific cardiac subtypes and provide a model system for basic research focused on understanding the mechanisms of chamber specification in vertebrate hearts. The authors of this manuscript have no competing financial interests. This work was supported by NIH grants HL083958 and HL100398 (A.K.H.) and 2T32HL007411-33 "Program in Cardiovascular Mechanisms: Training in Investigation" (J.B.). Loya, K., Eggenschwiler, R., et al. Hepatic differentiation of pluripotent stem cells. Biological Chemistry. 390, (10), 1047-1055 (2009). Narazaki, G., Uosaki, H., et al. Directed and systematic differentiation of cardiovascular cells from mouse induced pluripotent stem cells. Circulation. 118, (5), 498-506 (2008). Zhang, Y., Pak, C., et al. Rapid single-step induction of functional neurons from human pluripotent stem cells. Neuron. 78, (5), 785-798 (2013). Park, I. H., Arora, N., et al. Disease-specific induced pluripotent stem cells. Cell. 134, (5), 877-886 (2008). Golos, T. G., Giakoumopoulos, M., Garthwaite, M. A. Embryonic stem cells as models of trophoblast differentiation: progress, opportunities, and limitations. Reproduction. 140, (1), 3-9 (2010). Boheler, K. R., Czyz, J., Tweedie, D., Yang, H. T., Anisimov, S. V., Wobus, A. M. Differentiation of pluripotent embryonic stem cells Into cardiomyocytes. Circulation Research. 91, (3), 189-201 (2002). Burridge, P. W., Anderson, D., et al. Improved human embryonic stem cell embryoid body homogeneity and cardiomyocyte differentiation from a novel V-96 plate aggregation system highlights interline variability. Stem Cells. 25, (4), 929-938 (2007). Cai, C. L., Liang, X., et al. Isl1 Identifies a cardiac progenitor population that proliferates prior to differentiation and contributes a majority of cells to the heart. Developmental Cell. 5, (6), 877-889 (2003). Fujiwara, M., Yan, P., et al. Induction and enhancement of cardiac cell differentiation from mouse and human induced pluripotent stem cells with Cyclosporin-A. PLoS ONE. 6, (2), e16734 (2011). Rai, M., Walthall, J. M., Hu, J., Hatzopoulos, A. K. Continuous antagonism by Dkk1 counter activates canonical wnt signaling and promotes cardiomyocyte differentiation of embryonic stem cells. Stem Cells and Development. (1), 54-66 (2012). Burridge, P. W., Matsa, E., et al. Chemically defined generation of human cardiomyocytes. Nature Methods. 11, (8), 855-860 (2014). Lian, X., Zhang, J., et al. Directed cardiomyocyte differentiation from human pluripotent stem cells by modulating Wnt/β-catenin signaling under fully defined conditions. Nature Protocols. 8, (1), 162-175 (2013). Zhang, J., Klos, M., et al. Extracellular matrix promotes highly efficient cardiac differentiation of human pluripotent stem cells: the matrix sandwich method. Circulation Research. 111, (9), 1125-1136 (2012). Tanwar, V., Bylund, J. B., et al. Gremlin 2 promotes differentiation of embryonic stem cells to atrial fate by activation of the JNK signaling pathway. Stem Cells. 32, (7), 1774-1788 (2014). Kattman, S. J., Witty, A. D., et al. Stage-specific optimization of activin/nodal and BMP signaling promotes cardiac differentiation of mouse and human pluripotent stem cell lines. Cell Stem Cell. 8, (2), 228-240 (2011). Müller, I. I., Melville, D. B., et al. Functional modeling in zebrafish demonstrates that the atrial-fibrillation-associated gene GREM2 regulates cardiac laterality, cardiomyocyte differentiation and atrial rhythm. Disease Models & Mechanisms. 6, (2), 332-341 (2013). Kattamuri, C., Luedeke, D. M., Thompson, T. B. Expression and purification of recombinant protein related to DAN and cerberus (PRDC). Protein Expression and Purification. 82, (2), 389-395 (2012). Schulz, H., Kolde, R., et al. The FunGenES Database: A genomics resource for mouse embryonic stem cell differentiation. PLoS ONE. 4, (9), e6804 (2009). Phosphate-buffered saline (PBS). Cold Spring Harbor Protocols. (2006). Livak, K. J., Schmittgen, T. D. Analysis of relative gene expression data using Real-Time quantitative PCR and the 2−ΔΔCT method. Methods. 25, (4), 402-408 (2001). Beck, H., Semisch, M., Culmsee, C., Plesnila, N., Hatzopoulos, A. K. Egr-1 regulates expression of the glial scar component phosphacan in astrocytes after experimental stroke. American Journal of Pathology. 173, (1), 77-92 (2008). Graham, E. L., Balla, C., Franchino, H., Melman, Y., del Monte, F., Das, S. Isolation, culture, and functional characterization of adult mouse cardiomyoctyes. Journal of Visualized Experiments. (79), (2013). Brown, A. L., Johnson, B. E., Goodman, M. B. Patch clamp recording of ion channels expressed in Xenopus oocytes. Journal of Visualized Experiments. (20), (2008). Brown, A. L., Johnson, B. E., Goodman, M. B. Making patch-pipettes and sharp electrodes with a programmable puller. Journal of Visualized Experiments. (20), (2008). Sachinidis, A., Fleischmann, B. K., Kolossov, E., Wartenberg, M., Sauer, H., Hescheler, J. Cardiac specific differentiation of mouse embryonic stem cells. Cardiovascular Research. 58, (2), 278-291 (2003). Keller, G. M. In vitro differentiation of embryonic stem cells. Current Opinion in Cell Biology. 7, (6), 862-869 (1995). Höpfl, G., Gassmann, M., Desbaillets, I. Differentiating embryonic stem cells into embryoid bodies. Volume 2: molecular embryo analysis, live imaging, transgenesis, and cloning. Methods in Molecular Biology. 254-279 (2004). Ao, A., Williams, C. H., Hao, J., Hong, C. C. Modified mouse embryonic stem cell based assay for quantifying cardiogenic Induction Efficiency. Journal of Visualized Experiments. (50), (2011). Antonchuk, J., Gassmann, M., Desbaillets, I. Formation of embryoid bodies from human pluripotent stem cells using AggreWell™ plates. Basic Cell Culture Protocols. 946, 523-533 (2013). 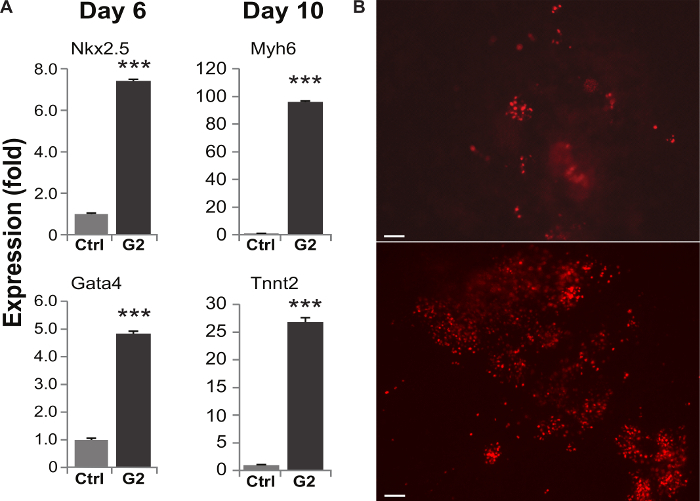 Horii, T., Nagao, Y., Tokunaga, T., Imai, H. Serum-free culture of murine primordial germ cells and embryonic germ cells. Theriogenology. 59, (5-6), 1257-1264 (2003).